Sorry I've been missing for the better part of this week - I've injured my knee somehow and it's really put a damper on things for me! Hopefully it will get better soon. Anyway....I made this card for a blogging friend of mine, and she's received it, so I'm going to share it with you now. I used one of those Tim Holtz Crazy dogs, along with the accessories pack for the balloons, party hat and sunglasses. I stamped each balloon on different colored snippets of cardstock with Versamark and embossed each one with white EP. The glasses were colored with a silver paint marker and a pink Copic marker, then covered with glossy accents for some extra shine. I added some glossy accents to his nose too. The sentiment is by SNSS and was heat-embossed with white on black. The enamel dots are from TE and I hand-drew the balloon strings with a black marker. I matted the image with black and placed it on a Melon Mambo cardbase. I hope you're having a great weekend. Our weather is amazing after the crazy spring we've had, but we're not done yet! It was 82 yesterday, 85 today, and tomorrow we will have wind chills in the 30s! Is that the weirdest forecast or what? 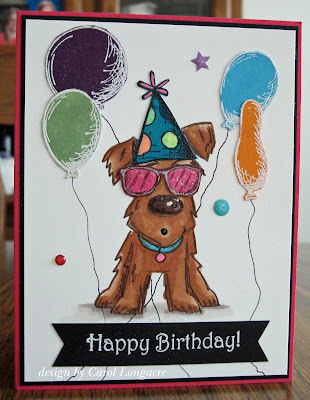 What a fun card, those sunglasses really change this into a party dog! Enjoy the weather! Oh, no! Sorry you hurt your knee. I am glad you are on the mend though. I do love that Crazy Dog design you did. That is so cute and I bet your friend is loving it too. Your coloring is so amazing and wonderful. A fun card Carol, a super image - the balloons really add to the party theme. I'm sorry to hear that you have injured your knee, I hope it gets better quickly. How many details and textures here! That big nose really pops out as well the glasses, its party hat and the balloons!! Your card is so cleverly designed! Your friend surely has smiled very much receiving this fun doggie!! His face is too much cute! The banner with the sentiment compliments perfectly the image! Very well done!! You already know how much I love it! It's screaming party time. Precious, fun, and yes.....once again, I LOVE it! What a FUN and bright birthday card- it fits great for our Sparkle and Shine theme @ Little Red Wagon this week. THanks for joining us ! What a happy card CArol, bet it gave the recipient a lot of pleasure, LOVE it. I hope your knee is more comfortable today. super cute card, fun image and awesome coloring! I am so glad you played along with us at simon says stamp wednesday challenge! I don't think you can ever go wrong with these TH dogs. I think they are a classic! Love the bright balloons, and the shades you added. Love it! Adorable card, So very Festive! You are so right about our crazy weather...How about all that rain last night! Hope your knee is much better! This is an adorable card and I'm sure it brought lots of smiles! So sorry to hear about your leg. Hope it gets better quick! I want the warm weather back its WAY to chilly for the end of April.